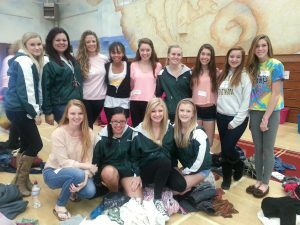 Thank you Point Loma High School for allowing us to use your gym space for our sorting event! We had over 100 volunteers hauling, sorting, organizing and enjoying their time working together with friends and family to make this event a success. We completed the task in record time and are looking forward to next week’s Distribution of clothing and accessories to our community girls in need. 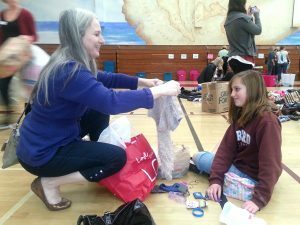 Shout out to all our mom and daughter volunteer teams and the dedicated community volunteers from all over San Diego! First step: sorting the clothing into sizes and making sure they are in gently used condition. 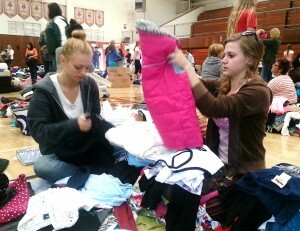 All smiles while organizing the clothing into categories: sweaters, pants, jackets, tops, etc. Checking to see if this is teenager worthy.